The Writer’s Jungle is designed to teach the homeschooling parent how to teach writing, and is the centerpiece of the Brave Writer program. The results? An activated writing voice, and a nurturing tear-free relationship with you, the parent-editor-coach-and-ally. The Writer’s Jungle works for all students, any age. This liberating, powerful home-study course comes in a binder format, or as a digital download. If you prefer support while learning these skills, consider taking The Writer's Jungle Online (our online writing course). This product also appears in our Jot it Down! Bundle and in our Partnership Writing Bundle. The Writer's Jungle can be purchased with The Arrow Subscription or The Boomerang Subscription or Help for High School. Designed for families with children 8-18. For younger children, check out our product: Jot It Down! Formats: The Writer's Jungle comes in PDF format (suitable for tablets and computers, 260+ pages), or in a sleek three-ring binder, which includes tab dividers for the 20 chapters, and wide margin space for your copious notes. The Writer's Jungle has sold over ten thousand copies and continues to be a hugely popular resource for homeschooling parents. The Writer's Jungle is the centerpiece to the Brave Writer program and lifestyle. The missing ingredient in writing curricula isn't how to structure a paragraph (information that can be readily found on the Internet). You don't need more facts about topic sentences or how to use libraries. Grammar and spelling are not the key components in writing, either, much to the chagrin of some English teachers. Writing is first and foremost about writers—people with ideas, thoughts, and insights they want to share. Readers are cultivated by risky writing—writing that hooks, fascinates, speaks, surprises, enlivens, and tells the truth. How do you help your kids reach inside and find those kinds of words? 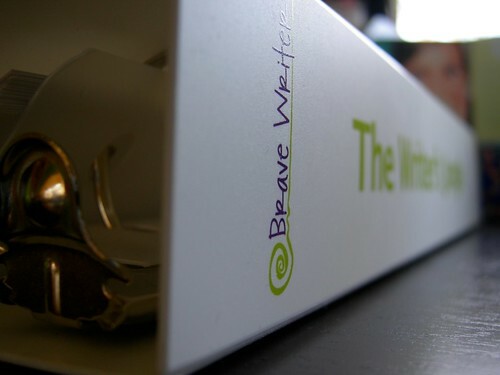 That's what Brave Writer is all about and that's what The Writer's Jungle is designed to help you do. The Writer's Jungle is much more than daily lesson plans or writing ideas. It takes you inside the writer's world. A reading list for parents! Most parents already own multiple writing programs—some own as many as 10! Parents confuse learning how to construct a descriptive paragraph with the process of accessing the language that lives inside. Writing is primarily about persons: We are Brave Writer, not Brave Writing. Learning how to transcribe one's thoughts accurately is not a substitute for the original thinking. When we reduce writing to formats, we rob it of its essence—the expression of a person in written form. Instead, we settle for words that fit style and structure sheets, editing guides and exercise goals. At that point, writing becomes a puzzle to solve (meeting the expectations of the guidelines rather than investigating one's inner life). Powerful writing means translating the internal thought life of a real person into written language that sounds like that person. Certainly there are skills to be learned along the way to support the communication value of that expression, but without the fundamental understanding of writing as an art, as a living, personalized, expression of each child, we risk robbing our kids of the joy and freedom that ought to be a part of every writer's life. The Writer's Jungle is both a guide to a parent's role in partnering with a child in writing, as well as a set of processes to be used by the child to learn how to write. Chapter 1: Shares language arts practices that create a language rich environment in your home. The processes of copywork and dictation are laid out in detail including new tactics for dictation not seen elsewhere (what we call French dictation and Reverse dictation). Chapter 2: Begins with the principles of communication. Rather than leading your child directly to the page, we begin with a white board, marker, and conversation. Kids discover how important the selection of apt words are to the power of their communication in speaking, let alone in writing. Chapter 3: Explores the importance of keenly observing the subject or object for writing. Probing questions help the student explore a concrete object using all five senses, yielding rich language, and metaphor and insight that is not as easily discovered through those "descriptive paragraph" assignments. Chapter 4: Introduces a key practice in the Brave Writer lifestyle: freewriting. Freewriting is both a method for learning to write fluently with ease, and it is the primary tool for drafting any writing assignment. Chapter 5: Offers practical tips and tools for getting to the heart of the writing anxiety that your child experiences, and helps students overcome writer's block. Chapter 6: Introduces a method for narrowing the scope of those overwhelming writing assignments that expect kids to "write a paragraph on the Civil War." Chapters 7-9: Take you step-by step through the revision and editing phases of writing. Parents are coached in how to give feedback to writing without evoking tears or distress in their student writers, all while helping to enhance and expand the writing content. Chapters 10-17: Word games, writing voice, a guide to writing an elementary school report, a method to evaluate and modify "dumb" writing assignments, journaling, the natural stages of growth in writing, and sample year long writing schedules for each stage of development. The Writer's Jungle includes student samples and instructor feedback on many of the exercises as models for you to follow. Most popular chapter: Chapter 14. In it, I detail the natural stages of growth in the life of a writer from pre-writing all the way to adult level competence. This continuum is not a scope and sequence of skills to be mastered, but a guide to determine your child's current level of fluency in writing. This information will transform how you direct your child's writing life. Download a free digital sample (select in the "Version" drop down menu below). In it, you will find the Introduction, the Table of Contents, a sample exercise, and one sample chapter. All purchases of digital products are FINAL. No refunds. For print copies, refunds available within 8 weeks of original purchase.